Or view larger version. Mesi-Leader. 1979-1992. Harry Fonseca. Drawing on paper. Collection of Oakland Museum of California. 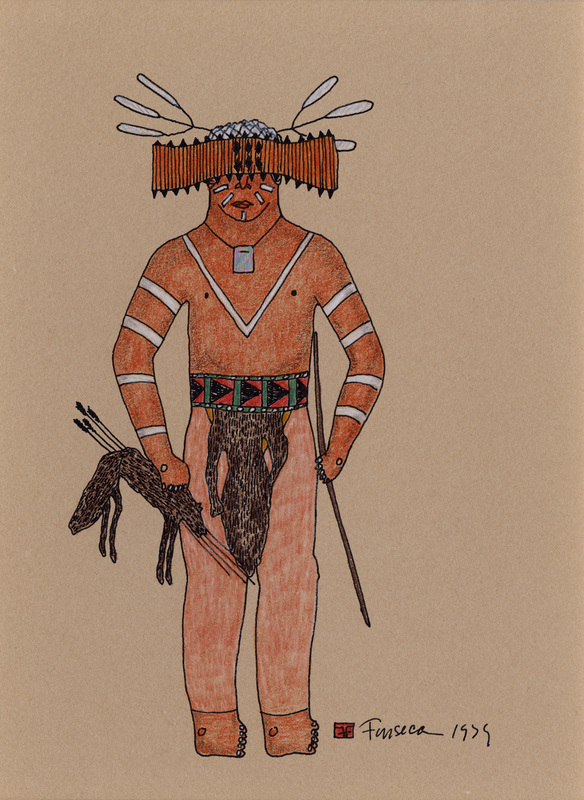 This drawing, by Harry Fonseca, done on tan paper in ink and colored pencil is from a series reflecting ceremonial dances of the Chico Maidu. Last celebrated at Chico in 1906, the cycle of ceremonial dances of the Chico Maidu at he village of Mikchopdo were given as visible prayers to the Creator and various spirits; they began in the fall and continued through late spring. They were given in a large earth-covered structure called the kum, or ceremonial roundhouse. After the death of the village leader Holi Lafonso in 1906, the Chico Maidu people traveled to neighboring Patwin, Salt Pomo and Nomlaki villages to dance. Today, some of the dances are being kept alive by Maidu and non-Maidu dancers.